Actin is a highly abundant (10-100 micromolar on average),~42 kDa structural protein found in all eukaryotic cells (except for nematode sperm). 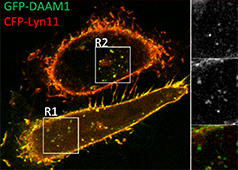 With more than 95% conservation in the primary structure, actin is one of the most highly-conserved proteins . The monomeric, globular form of actin, known as G-actin, forms the basic unit for actin filaments. In many cases actin filaments may bundle together with other actin filaments, or, together with their associated motor proteins (e.g. myosin superfamily) form an elaborate network known as the actin cytoskeleton. 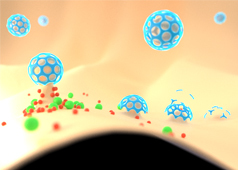 This occurs primarily at or near the plasma membrane. Consequently a region of high actin filament density is commonly found at the cell periphery and is known as the cell cortex. 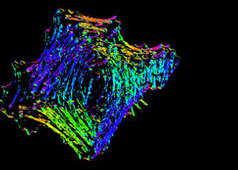 Actin filaments in the cell cortex determine the shape, stiffness and movement of the cell surface. 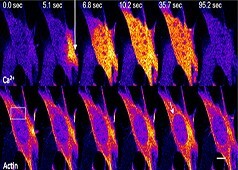 The actin cytoskeleton also facilitates the transduction of mechanical signals, and can generate the intracellular forces that are required for many cellular functions including cell motility, muscle contraction, cell division, cytokinesis, vesicle and organelle movement and cell signaling. 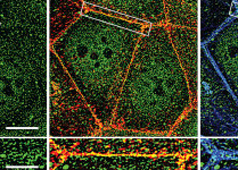 Actin also contributes to the formation and maintenance of cell junctions. The structure shown here  was downloaded from the RSCB Protein Data Bank (PDB file: 1atn). 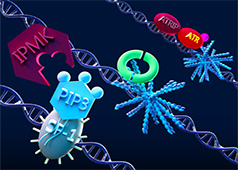 The ATP binding cleft is starred (*) on the right. 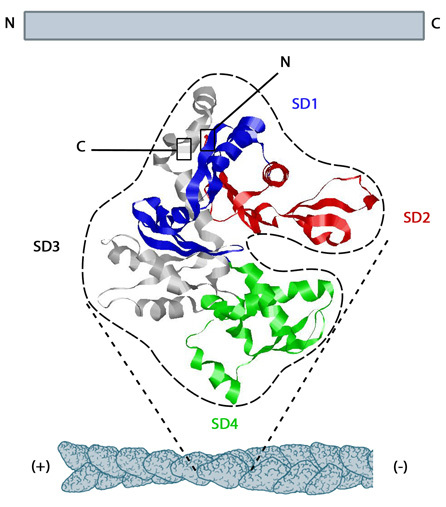 Actin comprises four subdomains, termed SD1 (blue), SD2 (red), SD3 (grey) and SD4 (green). The barbed end of each monomer (SD1 and SD3) is shown on the left and the pointed end (SD2 and SD4) is shown on the right. Similarly the polarity of the actin filament, which comprises these monomers is shown at the bottom, with the barbed (+) end on the left and the pointed (-) end on the right. 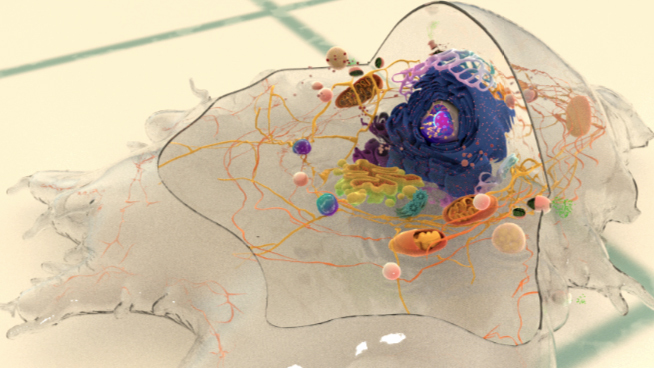 Higher eukaryotes commonly express several isoforms of actin; encoded by a family of related genes. Actin isoforms are divided into three classes (alpha [α], beta [β] and gamma [γ]) according to their isoelectric point. In general, alpha actins are found in muscle (α-skeletal, α-aortic smooth, α-cardiac, and γ2-enteric smooth), whereas beta and gamma isoforms are prominent in non-muscle cells (β- and γ1-cytoplasmic). Early models that described actin filaments were constructed by fitting the filament x-ray crystal structure to the atomic structure of actin monomers  (reviewed in ). More recent models used a number of different approaches . Collectively however these results suggest that when single actin strands form, two asymmetric actin monomers align to form a twofold axis of symmetry ; their subsequent assembly into a filament that is composed of a pair of strands causes a left-handed helical twist when the adjacent subunits are positioned with respect to each other . Actin filaments are highly dynamic and their polymerization is usually correlated to their disassembly. Generally, actin filament polymerization occurs over three phases: A nucleation phase, an elongation phase and a steady state phase. 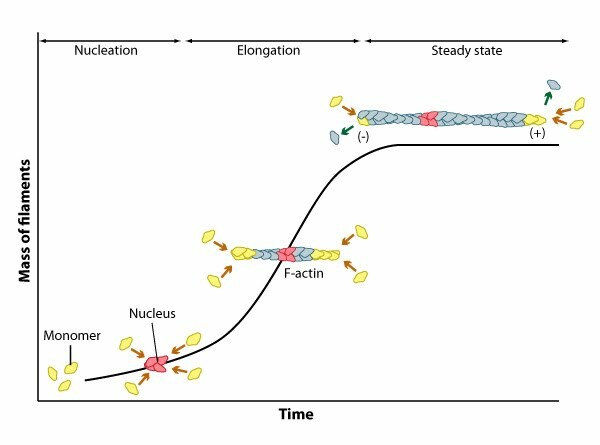 Nucleation, elongation, and steady state phase of actin filament assembly. During the nucleation phase the formation of a stable ‘actin nucleus’ occurs. This is usually comprised of three actin monomers in complex. In the elongation phase monomers are rapidly added to the filament at the (+ve) or barbed end and this is often facilitated by additional elongation factors such as formin. For this process to occur, the (+) end of the filament must be exposed, and this means removal of *capping protein.